A long-awaited day, splendidly beautiful and no one wanted to be indoors. The sun, earth and water beckoned, and the Ladies of the Lake came out for another beer venture. At least annually, we feature an all women panel for the Beer Beacon. Joining the Beer Diva for the Fruit Beers and Wheat Beers tasting were Half Pint, Sidekick, Shotzy and Proxy. The afternoon was sunny, the lake view from the deck was gorgeous and the steward was especially attentive to, and appreciated by, all the ladies. 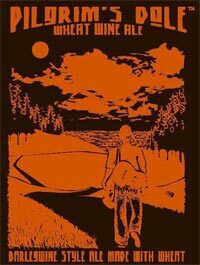 for girlfriends, fruit beers, wheat beers and sunshine! Joining the Beer Diva for the Fruit Beers and Wheat Beers tasting were Half Pint, Sidekick, Shotzy and Proxy. 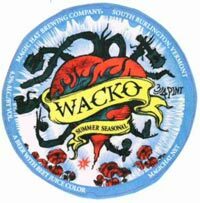 Wacko Summer Seasonal, Magic Hat Brewing Co.
Sidekick described the taste as “orangey, mildly spicy and leaves a nice hop finish on my tongue”. The Beer Diva thought it was smooth and refreshing with a sweet, nutmeg finish. Half Pint found it fizzy, without much aroma and a very subtle flavor. Proxy agreed, nothing popped out flavor-wise, but it wasn't a toss over the railing beer. “I love the Champagne texture,” said Half Pint. “It's so effervescent, with such a pretty pinkish purple head.” “The fruity, raspberry, strawberry flavor is so powerful,” commented Proxy. Sidekick went out on a limb and guessed it was huckleberry or pomegranate fruit and thought it would go great with desserts or Chinese food. Shotzy was pleasantly surprised that there was no beery taste to it and likened it to wine. “Where can I get this?” she asked. 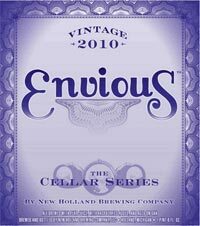 We all thought it was an excellent transition beer for wine lovers. 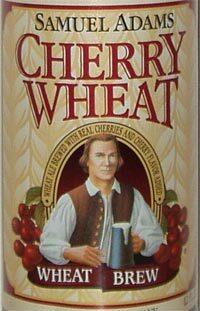 Sam Adams Cherry Wheat, Boston Beer Co.
“A mouthful of flavor in this beer,” exclaimed Proxy. “I taste apricots, melons, almonds and vanilla creaminess in the finish.” “It smells and tastes like candy, maybe a Tootsie Roll with a cough drop finish?” suggested Sidekick. Shotzy thought this beer would be perfect with cheesecake. Half Pint noted that the beer gets even better as it warms up and recommended taking it on a picnic this summer. As for the Beer Diva - she's way too bitter for this sweet beer. Easy to drink, according to Sidekick, with very little after taste. “Refreshing and clean,” remarked Half Pint who thought it a great ballpark or B Bay beer. Refreshing on a hot day, noted Proxy. We all thought it would pair nicely with BBQ meats or fish. “A great beer pong beer,” declared Shotzy. 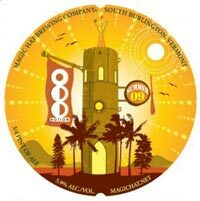 Odd Notion Series, Magic Hat Brewing Co.
Half Pint described the nice tangerine, fruit flavor and announced, “I defintely like it.” Shotzy tasted banana cloves and cinnamon basil. “It reminds me of a spicy, ShockTop,” said Proxy. Sidekick tasted a gingery spiced middle and a nice citrus hops finish. We were puzzled when trying to pair this beer with food and agreed it would have to be a powerful match like curry. 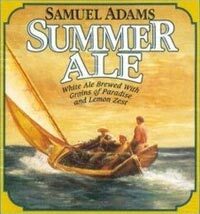 Sam Adams Summer Ale, Boston Brewing Co.
“Refreshing and crisp at first, but a subtle lemon fruit and spice flavor that smoothes over my palate,” remarked Proxy. “I taste some cinnamon and cilantro that ends in a dry finish that would be good with Stilton,” suggested Sidekick. Shotzy thought it would also go good with wings, because it is light. “Ahhh! Grains of Paradise - isn't that what summer is all about?” acknowledged the Beer Diva when the bottle was revealed. 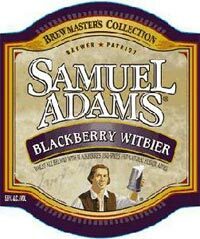 Sam Adams Blackberry Witbier, Boston Brewing Co.
“Very berry on the nose, with some black cherry and raspberry flavors,” noted Proxy. Not tart or bitter, nice and refreshing with a sweet berry finish, agreed Half Pint. “The coriander and berry citrus backbone is nice, but it is too sweet,” said the hops-craving Beer Diva. 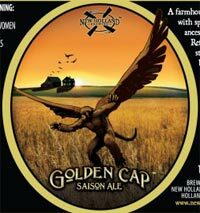 “This beer would go well with berry pie, a fruit crumble or berry tart,” suggested Shotzy. 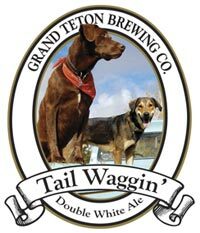 Tail Waggin' Double White Ale, Grand Teton Brewing Co.
“This is a beer I could drink a lot of,” admitted Half Pint. Sidekick noticed the typical Belgian aroma of bubblegum with nice spiciness of clove and banana, and a refreshing woodsy, peat flavor. “Kind of dry and wine-like,” said Proxy. “It finishes very nice and would go well with strong cheese and crackers because the flavor of the beer wouldn't get lost.” Shotzy thought the taste was too earthy and strong. 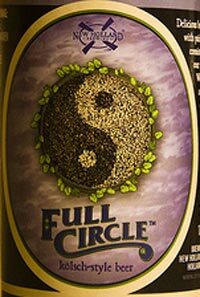 It's brewed with spelt (a grain that is an ancestor of wheat), and this contributed to the flavor according to the Beer Diva. Proxy said it was smooth and very malty with a caramel taste. “Not a warm weather beer, but one that is to be shared with friends and a fireplace,” suggested Sidekick. “Or at a cold bonfire,” agreed Half Pint, “as it heats up my whole mouth and throat.” The Beer Diva recommends lots of hearty Moroccan stew or White Chili to accompany this barley wine like beer. Half Pint commented that curiously, though it was served cold, the beer tasted warm. Shotzy liked the wine-like, fruity taste with oaky undertones. Proxy agreed it was similar to a port with a berry malt and tart boldness that demanded the attention of our wearying taste buds. Sidekick almost fell over from the first taste jolt, but as she slowly sipped the multifaceted elixir, she appreciated the depth of the taste experience. This is a very special occasion beer and the Beer Diva was honored to finish our tasting so stupendously.